This is a beautiful piece of art work from the talented SIMONE BIANCHI! This awesome page is from. THE THANOS RISING MINI SERIES #5. Pg 11 and depicts Thanos and Death partaking in sweet talk! This piece is done on large art page, and comes in a mylar for added protection. Bianchi art work is very difficult to find and goes very quickly whenever anything is offered. Own this great piece now... 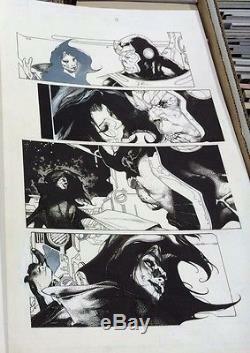 The item "ORIGINAL THANOS RISING #5 PG 11 SIMONE BIANCHI COMIC ART PAGE! Movie" is in sale since Sunday, June 15, 2014. This item is in the category "Collectibles\Comics\Original Comic Art\Splash Pages". The seller is "the_comiclord" and is located in WARP 9---Clawson, MI. This item can be shipped worldwide.